Mercedes-Benz is moving forward in its global march to be the top luxury brand around the globe. At the Auto Shanghai 2013 they will unveil a new Concept GLA that will give us a preview of things to come. The Concept GLA is a "close-to-production study” and will provide a good idea of what the new forthcoming GLA-Class will look like. The new GLA-Class will be a new compact premium SUV for the German automaker. Why does Mercedes seem to be moving in a new direction with the introduction of smaller premium vehicles? Mercedes knows if they are to overtake BMW and Audi, they will have to change their philosophy. In the past, the luxury brand was known for their elegance and grace more than being sporty and youthful. Today, they need to attract a new generation of buyers in their 30s and 40s around the globe. We see it with the launch of the new CLA four-door coupe and the new A-Class that is popular in Europe. Mercedes will need to attract buyers who have never purchased a Mercedes car before. The Concept GLA will preview a new segment and give Mercedes a premium compact SUV. Mercedes-Benz will unveil the new compact premium-class SUV at the "Auto Shanghai" motor show that will be open to the public from April 21 to 29. The Concept GLA combines dynamic styling with clear benefits for recreational use that is designed to appeal to a younger generation of consumers. This generation wants modern styling along with the latest technology with a high degree of leisure value. What does the Concept GLA show us about the new GLA Class? The Concept GLA that will be at the show will be powered by a 155 kW (211 hp) four-cylinder two-liter turbocharged gasoline engine. Power will be transmitted to a new extremely lightweight and compact 4MATIC all-wheel drive that Mercedes-Benz developed specifically for its new premium compact cars. The 2.0-liter powerplant will be mated to a new innovative 7G-DCT dual-clutch gearbox that will transfer power to all four wheels. We will also see Mercedes take a new approach to the luxury compact SUV with its sporty exterior design and a coupe-like look. The GLA Class will use the same architecture that Mercedes uses for the basis of the successful A-and B Class models. 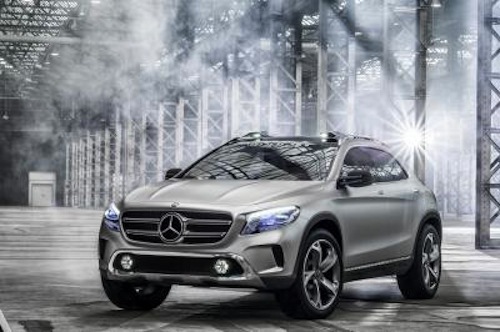 The new Concept GLA will also take a new approach in the form of headlamps featuring laser technology. Mercedes says the they not only shine more light on the road, but also function as projectors. The front headlamps of the Concept GLA are each fitted with a laser-beam projector. These not only provide the light to drive by, but are also capable of projecting pictures or films onto a screen or other surface. Any format that can be operated through COMAND Online can serve as a source: pictures or films from a smartphone, the internet, or from a hard drive. They also pulsate a blue light with the "Coming home" function, the blue light begins to pulsate to indicate that the vehicle is ready and waiting for its driver. The new Concept GLA gives us a good idea of what Mercedes has planned for their new GLA Class compact premium SUV that is very likely to reach production. Mercedes is certainly going after a new generation of buyers, and this coupe-like evolution will be a new segment and reach new buyers for the brand.